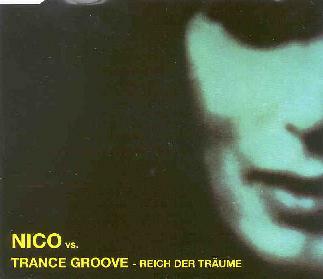 Nico vs. Trance Groove - "Reich der Träume"
I'm going to do my best to figure this one out. Of course, Nico is famous for her early collaboration with Velvet Underground, and not so famous for her later collaboration with Agitation Free's Lutz (aka Lüül) Ulbrich. At least in this country. But it's this latter team that created the original track "Reich der Träume" on the debut Lüül album in 1980 that here is revisited with the assistance of a modern German electronica group, Trance Groove. I can't tell exactly how the original tune (written by Ulbrich) sounded on the Lüül album, as I'm guessing that all the music here is courtesy of Trance Groove, i.e., only the Nico vocal track is retained from the old version. All three versions presented here (including the 'Remix' and 'Radio Edit') are hardly the sort of rave-ready electronica that I usually associate with the term 'Remix.' The music is more like a sultry, soft jazz, though done with the help of a fair number of loop devices and other synthesizers. The bassline is rich-sounding and moves around a fair bit, and it sounds like a real bass guitar though I can't be sure. The drums are definitely real (seemingly played with brushes), although there's an additional underlying swishy percussion loop added in. Reiner Winterschladen of the Trance Groove quartet plays jazz trumpet (with mute) accompaniment that appears on all three versions. Nico's vocal lines are sung in German, and are every bit as sultry as the music itself... she had a special voice no doubt. Though because one particular 15-second vocal sample from the original is repeated many times throughout each version, you get a little tired of it if you listen to the 20-minute disc straight through. And the 'Remix' version doesn't even include the second vocal clip, so it's basically a 'dumbed-down' version of the first one. Well, I think some of the keyboard parts are different at least. I can't figure out what audience this single release is targeted for... I suppose it's for DJ's and radio programs mainly, something which I'm totally unfamiliar, so I can't say for sure. I do like the first version as presented here, and wonder how it compared to the original album. I guess Spalax has now done a CD reissue of 'Lüül,' so maybe I'll find out soon. There didn't seem to be so much need for a 'Remix,' as it really wasn't that much different from the other one. And the 'Radio Edit' apparently just had three minutes removed to make it five minutes long instead of eight. Contacts: Fhnfundvierzig, Schmiedetwiete 6, 23898, Labenz Germany. Distributed in the US by innerSpace Records, P.O. Box 411241, San Francisco, CA 94141-1241. You can visit their web site at http://www.innerspacerecords.com. You can visit Lüül's webpage is at http://www.luul.de.